Original model (PSP-1000) an logo o the PSP. 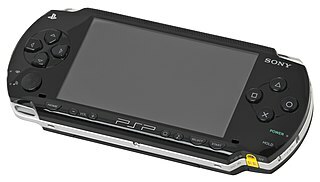 The PlayStation Portable (PSP) is a haundheld gemme console developed bi Sony. ↑ "Untold Legends: The Warrior's Code". Sony. Archived frae the oreeginal on 2006-11-12. Retrieved 2007-06-07. ↑ "Platinum Titles". Capcom. Retrieved 2011-05-26. ↑ "PSP Technical Specifications". Sony Computer Entertainment. Archived frae the oreeginal on 2008-03-13. Retrieved 2008-03-12. This page wis last eeditit on 28 Julie 2017, at 22:14.